Most of us know that the automatic transmission fluid should be changed periodically (i.e. every 24 months or 20,000 miles/30,000 kilometers). Did you know that to perform the proper service, you should ensure that not only is the transmission sump drained and filter replaced, but that all the fluid in the torque converter and cooling lines and coolers is changed? Approximately one half of the total fluid capacity of the transmission is contained in those areas other than the sump. This task is more extensive than the typical do-it-yourself-type may want to tackle. It is important to the longevity of the transmission that all the fluid be flushed from the system. Check with your service center to make sure that they change all the fluid. It might mean the difference between a trouble free trip and a disaster. Note: Ford has recently issued a new Flush and Fill service tool that is a more effective way to change the transmission fluid on F53 Chassis. 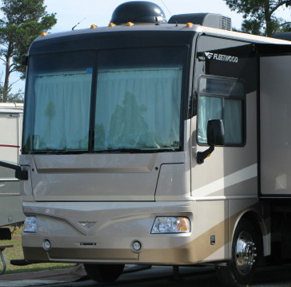 During the latter part of our summer vacation, I noticed that the fridge had automatically switched to propane gas operation, even though we had the coach connected to campground power. I checked all the usually power connections and circuit breakers; all seemed fine. After reading the instruction manual, I thought that a 12 Volt, glass type, fuse had blown. This fuse (and one other) is mounted under the black plastic circuit board cover. To access the board, you must remove the cover found on the back of the fridge on the outside of the coach. Both fuses were not blown. After this check out procedure, I believe most service technicians would have replaced the circuit board, since all other components are encapsulated in epoxy. Close examination of the push-on wire connectors revealed one that was corroded (green) not shiny silver like the others. That defective connector led right to the fuse that controlled the AC. After disconnecting all power, I carefully removed the wire mounted connector and cleaned it using sandpaper. I also cleaned the circuit board pin, applied dielectric grease to protect both from further corrosion and reconnected all the power sources. AC operation resumed and the system has operated normally ever since. The moral to the story: Check all obvious areas for trouble before condemning the circuit board and throwing away $200 in perfectly good parts. Changing the circuit board would likely have cured the problem (for a little while) since removing the connector would have scraped the corrosion enough to make an electrical connection and the new circuit board would have had a bright shiny pin. The question arises: Why was only one connector corroded? I'll leave you that one to ponder. 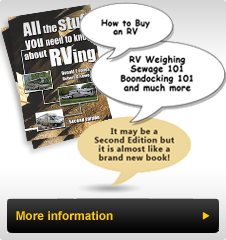 hello www.rv-partsplus.com and thank you for your info. I've certainly picked up something new from right here.